Prior to removing rhinestones, figure out if they are glued onto the fabric or fully inserted into the fabric with prongs. Look at the back or inside of the jeans where the rhinestones are. If you see prongs, the rhinestones are inserted with prongs, and if you do not see anything, the rhinestones are glued in place. Dip a paper towel in acetone nail polish remover. 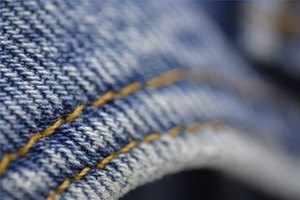 Test the acetone in an inconspicuous area, such as the inside bottom cuff on the jeans, to be sure that the acetone will not ruin the dye on the jeans. Let the acetone dry. If it did not ruin the clothing, proceed to step 2. If the acetone ruins the dye, do not use acetone. Dip a cotton swab in acetone nail polish remover. Place the swab under the edges of the rhinestone. Lift the rhinestone and continue working the acetone under the rhinestone until it is removed. Continue doing this until all rhinestones are removed. Remove any remaining residue. Dip a rag in acetone nail polish remover and lightly rub over the residue to remove it. Launder the jeans as normal. Put fabric glue remover on a cotton swab. Place the cotton swab around the edges of the rhinestone. Let it sit for one to two minutes. Lift the edges of the rhinestone. Place more fabric glue remover under the lifted edges and let sit one to two minutes. Continue lifting the rhinestone and placing glue remover until the rhinestone is all the way removed. Continue this process until you remove all rhinestones. Remove any remaining residue. Lightly rub a cotton swab dipped in fabric glue remover over the residue to remove it. Launder the jeans as usual. Find a tool that fits under the rhinestone prongs and can help lift them. This can be something such as a paring knife, envelope opener or a safety razor blade. Slide the tool under the edge of the rhinestone prong. Lift the prong. Repeat this process until all prongs on the rhinestones are lifted. Pull the rhinestone gently to remove it. You may have to wiggle the rhinestone to work the prongs out of the fabric. Do not pull hard or you may tear the fabric. The prongs may cause permanent damage to the jeans. There is nothing you can do to prevent this, as it happened when the prongs went in, and there is no way of knowing whether damage exists until the rhinestone is removed. 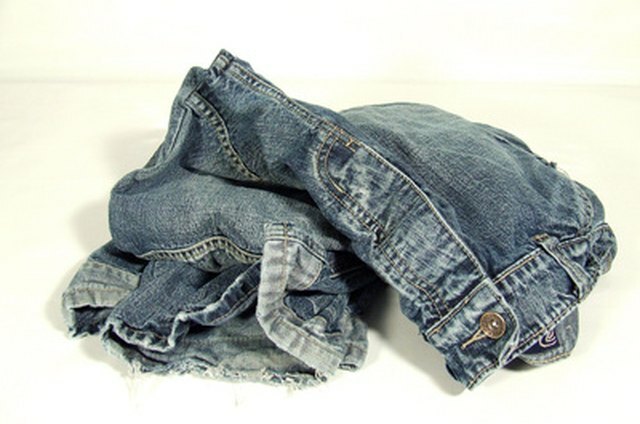 Once rhinestones are removed, the area underneath the rhinestones may be darker in color than the rest of the jeans.